Every Friday while I'm watching Fashion Police on E!, I always think to myself how much I love Giuliana Rancic's hair color! Her roots start in a dark brown shade, but as the hair falls, the color lightens until it's basically butterscotch blonde at the tips. Her two-toned hair, also known as ombre, always catches my eye, and I'm loving it! Giuliana isn't the only celebrity trying out this trend though. Shenae Grimes, Drew Barrymore, Hilary Duff, Jessica Biel, Rachel Bilson, Sarah Jessica Parker, and my favorite, Lauren Conrad, among others have been experimenting with this look. It's almost like they let their roots grow out so that their natural color shows, but the color happens to blend perfectly with the previous color. Have you tried coloring your hair this way, or is your hair naturally like this? I would love to hear for my followers! What's your take on this hair trend? Daring or Dreadful? 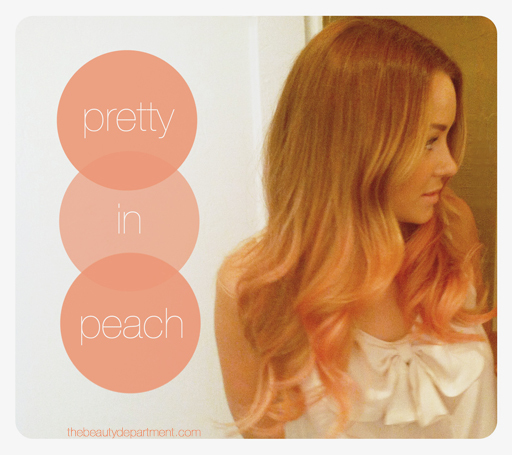 Lauren Conrad took it to the next level and tried the ombre look with peach. She asked the readers of The Beauty Department Blog if she should try this trend, and they said yes! Is this too extreme for you? sometimes i don't mind this two toned hair, but when it's really drastic - i don't really care for it!! I love ombre hair! I have been wanting to do it to mine, but still thinking about it! I actually like the ombre (on most) and I tried it on my hair and it totally fried :( Cute look, not good on your hair though. Oh, I finally know what ombre hair is! I'd heard of it everywhere but had been too lazy to look it up, hehe. And I really like the peach tips ;). I actually love this look. I tried to get my hair stylist to ombre me about a year ago and he pretty much told me no (since I am so blonde it would basically have been a reverse ombre, and he said I would hate it). It was a sad, sad day. This post makes me want it again. I LOVE this look. If it were possible with my hair, I would totally do it! i love it! it's my style right now actually as you can see in my photos! not that blonde though, cause my hair is naturally dark, but my skin looks much healthy with warm colors, i think is a great look, a little bit daring but once you start it's almost impossible to go back! If it's done right, I love it! Looks great on Lauren Conrad. I agree, when done right is lovely! So tempted to get a dip-dye but i'm worried my brown will go ginger! Lauren Conrad has the most beautiful hair in the world!! I had my hair ombred for like a year! I LOVED it, im considering dying it back, i miss it :( if you go really blonde on the tips you can put in washout colors for special occasions! It looks so cool on them, but I don't think I could pull it off. Do it Do it Do it! I wanted to try it but I need a trim and I've never colored my hair, sooo scared. Oh! I looove The beauty Department blog! I stumbled over it over the summer, and was shocked to find out it was run by Lauren Conrad and her friends. The site made me like her, because I just didn't care for her in the past. Thank you for your commnet on my new post! Although it's a risky and difficult style I love it!! I am your new follower!Come by my blog and follow back if you like! I like this hairtrend, but I has to be natural colours from dark to light or something. I got my hair ombred about 6 months ago and I love it, I haven't had to die my hair at all in that time, it's amazing! I love it because it reminds me of sun kissed hair in summer! Such a big fan of the ombre hair! Love the way lauren conrad ombre dyed her hair! I love ombre hair! Mine is slightly ombre but not as drastic as the ladies pictures. I would definitely love a more dramatic look! Definitely not a fan!It looks good on SJP, though! hate hate hate. ugh. i think it looks 'dirty' in a way. I think it looks great. The peach is a really great idea I haven't seen it before! I wouldn't take it too extreme with a completely different colour, but the examples you have displayed look lovely! I really like the look, but not sure it would work for me. I quite like it if it looks like it's quite natural :). Peach color also look good. Personally I think its great! Hi to all, for the reason that I am in fact eager of reading this website's post to be updated daily.